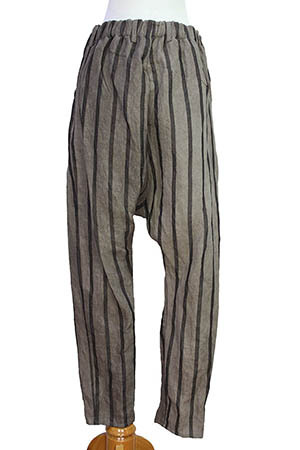 Nostrasantissima striped, low-crotch trousers in an amazing fabric. Folded front panel with stitch details. Elasticated rear waistband and belt loops. 2 rounded pockets. Diagonal seam details. All edges are finished. Superb Summer trousers that match the jacket and the shoes in the same fabric.